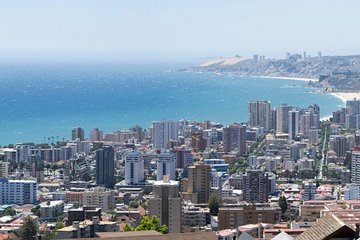 Descubra dos preciosas ciudades a lo largo de la costa central de Chile: Viña del Mar y Valparaíso, declarada Patrimonio de la Humanidad por la UNESCO, en esta excursión privada de 4 horas. Una experiencia en compañía de su familia y amigos a los monumentos de la ciudad de Viña del Mar, entre ellos el reloj de flores, Reñaca y la avenida San Martín. A continuación, explore el laberinto inclinado de calles adoquinadas de Valparaíso y sus funiculares históricos, como el Paseo de 21 de mayo y el cerro Concepción. A lo largo del camino, escuche los interesantes comentarios de su guía personal y chófer. Traslado al hotel incluido. We really liked our guide, Vincent, in terms of his personality and knowledge of the city. However, we did only about half of the advertised items on the itinerary. We did not even drive by La Sebastiana nor were we asked if we wanted to, the funicular's were closed due to a strike in the city, and we did not go downtown to observe any of the buildings. After driving through Vina del Mar and Renaca, we drove a bit in the hills of Cerro Bellavista, visited the cultural center grounds but basically as a bathroom stop - there were no exhibitions and then walked through a few of the streets on Cerro Concepción. No explanation was offered for why we hadn't visited La Sebastiana or the downtown area - nor were either offered as an option. My husband and I were both surprised when the tour was over and thought that maybe we had confused this tour description with another - until we got back to the hotel and read the description. It may have been a miscommunication with the tour company and Viator, but for 335 before we paid gratuities to the driver and Vincent, we expected more. It was a very disappointing experience for our first Viator tour.